Issed by the Japanese at the opening of the First Sino-Japanese War. 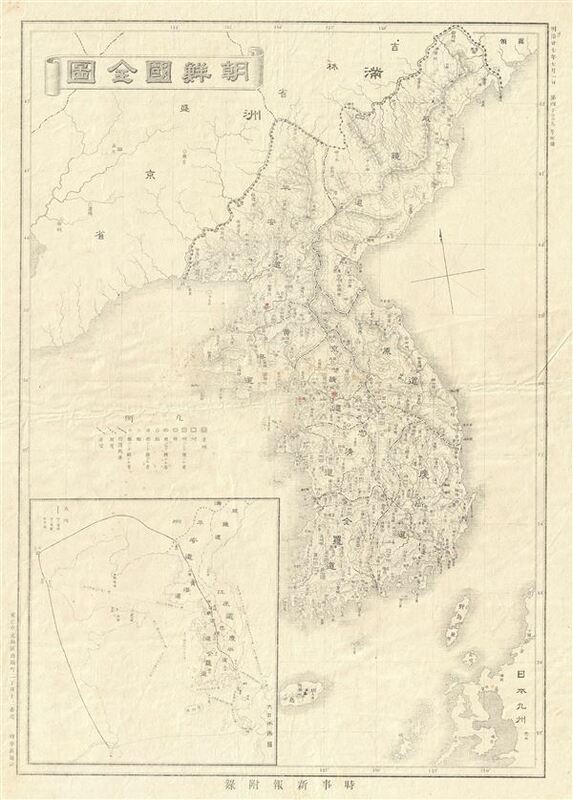 This is an unusual and scarce example of the 1894 or Meiji 27 Japanese map of Korea or Corea. This map of Korea, made in the first year of Emperor Taisho's reign, covers all of Peninsular Korea, inclusive of the Tsushima, Iki and Jeju Islands. An Inset map is included in lower left quadrant. It details town, rivers, roads, railways as well as other topographical features. This map was printed shortly before the first Sino-Japanese War fought between the Qing Dynasty of China and the Japan, over the control of Korea. The Japanese won the war and ended the dominance of China in East Asia. All text in Japanese. Issued by the Japanese in 1894. Very good. Some wear and creasing along original centerfold. Overall age wear and fading. Minor spotting.